So, I presented some of my ideas in a slide show for the combined boards. Here are the key slides. 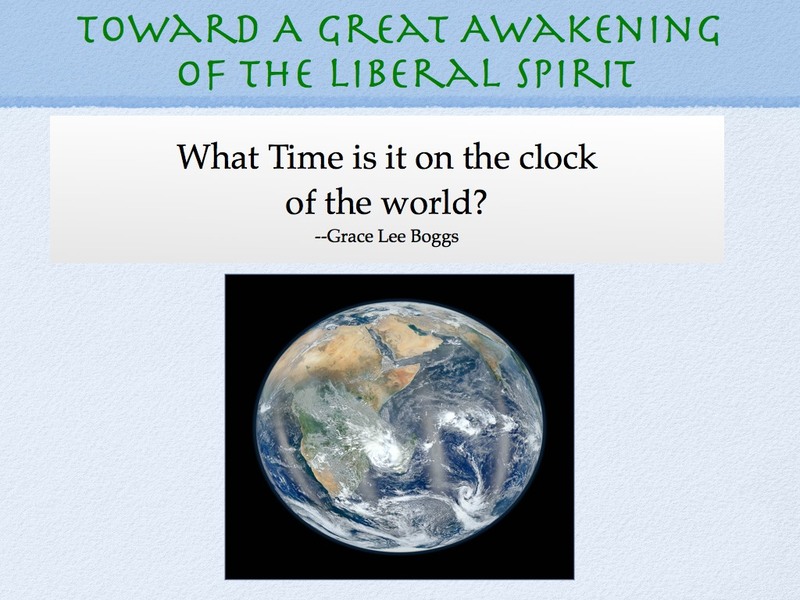 This question from Grace Lee Boggs, the Detroit activist, should start all of our strategizing. Everybody talks about MISSION. Coming to consensus on mission statement words is a waste of time. Everyone should state the understanding of our mission in their own words. There will be enough commonality to move ahead. This is what I say is UUism's mission. The most important word in a mission is the verb. 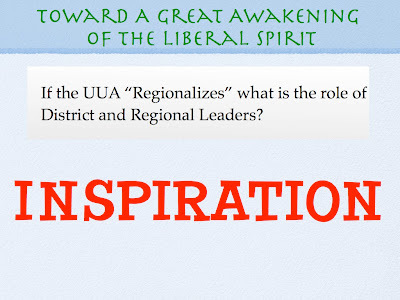 So what's the verb that describes the leading that regional leaders should be doing. Same as our mission: INSPIRE. 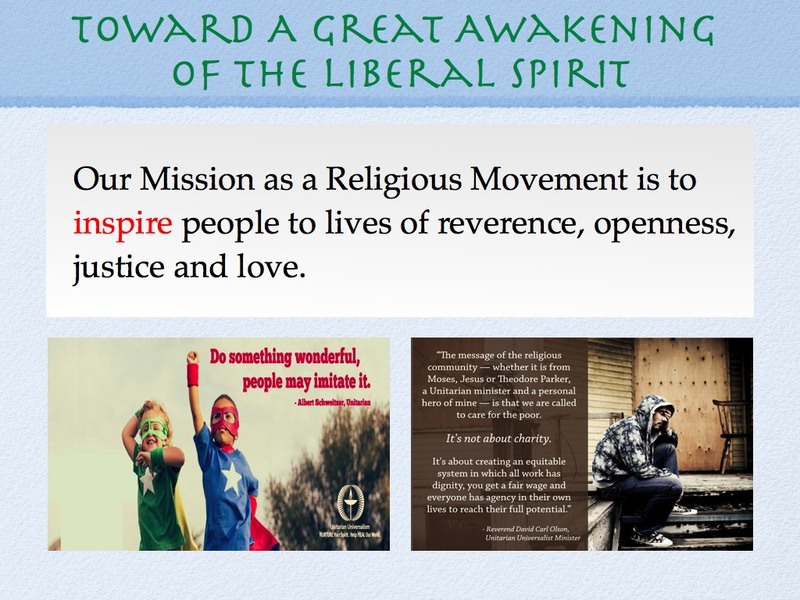 All the good stuff that we get from our congregations: spiritual development for children, sexuality education, opportunities for worship, contacts into the wider community, chances to engage in justice making action. 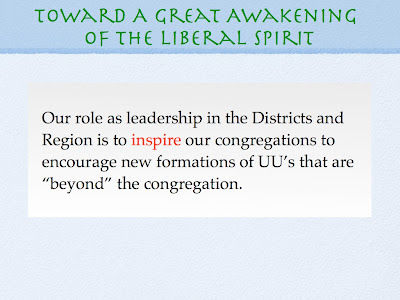 These are not the Benefits of belonging to a UU community; they are the services we offer to everyone in the community. 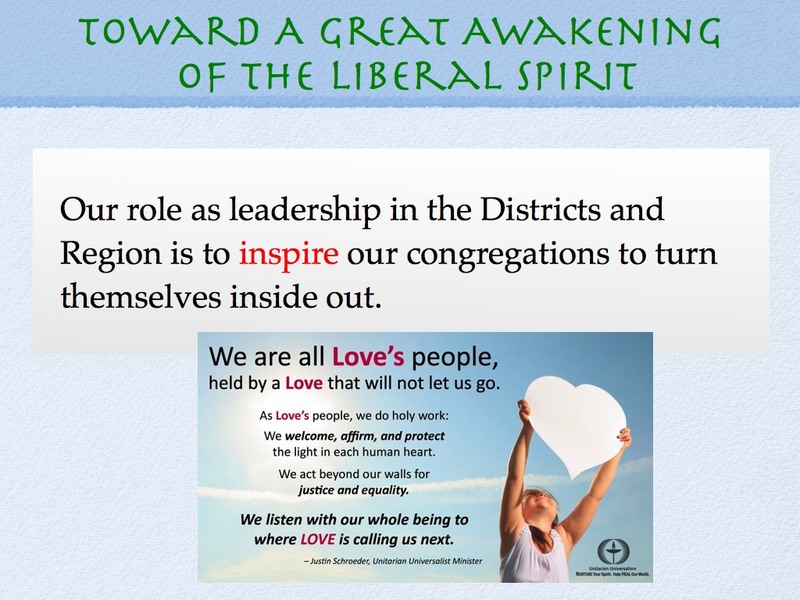 All the good stuff is on the inside in our congregations -- we have to turn them out. Think of this concrete example: OWL for ALL. I think that it is clear that lots of people want what we offer; they just don't like the form in which we are offering it. The spiritually hungry are not going to join our churches. So, we have to find ways to use what we have to offer what we have and they want in a form that works for them. Congregations and churches cannot do that themselves. They are too inside the old form. 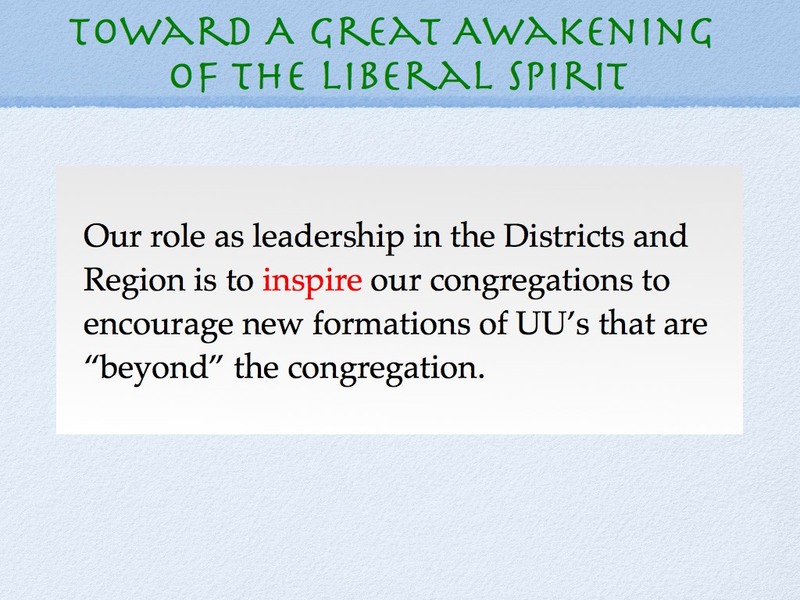 Leaders at other levels have to learn how to encourage the growth of new forms of Unitarian Universalist groups. 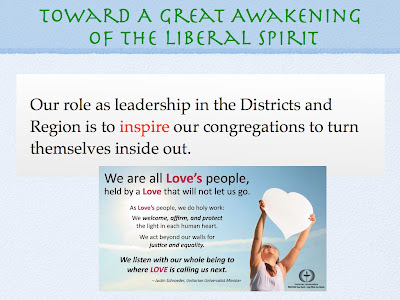 Are we, the people of all of our New England communities, becoming more reverent, more open, more just and more loving? Our end goal is the transformation of souls and the transformation of society. Everybody has their own take on exactly how those are related, but we know that they are. Religious Liberals are no longer in survival mode. 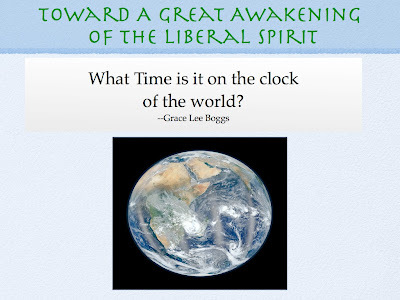 Our time to awaken the many is now. A congregation is a social network. It is one node in a much more complex and wide-ranging social networks. 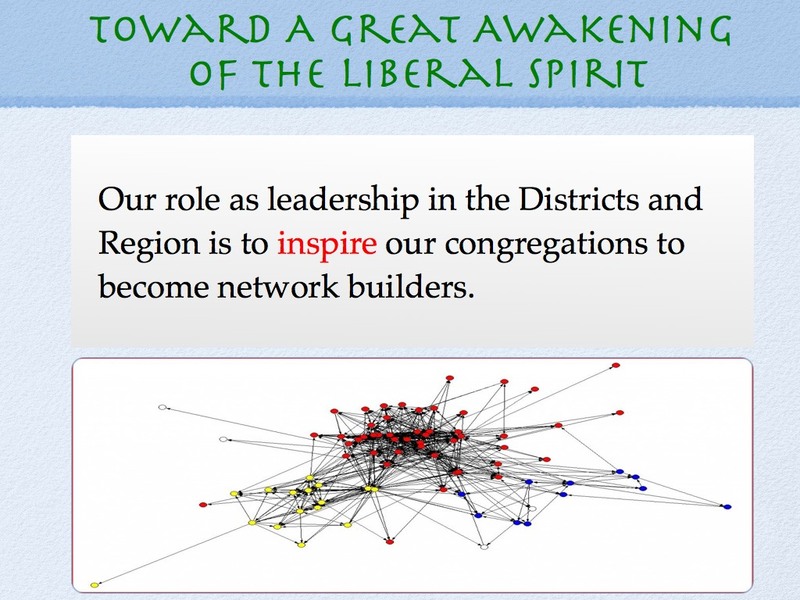 Imagine all the Facebook friendships within your congregation. Now imagine all the FB friends of those FB friends and how they cluster into other networks. How do we operate in all those networks to inspire people to lives of reverence, openness, justice and love? Hi Tom! My name is Jessica Ferguson and I'm from the UU Media Collaborative. 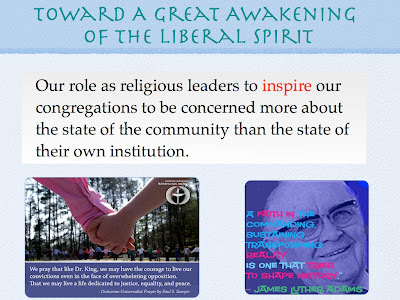 Many of the images used in this presentation are works I did for the UUMC. Its so fantastic to see you guys using them!! I'm so excited! One request - could you please add something to the presentation giving myself and/or the UUMC credit for the works that belong to us? We want them to be free for use by all - but would also like to retain some credit for doing them, both to help support the hard work of our designers/artists, and also to help market the group itself so we can continue to create amazing works. Thank you!